Roger Waters’ Incredible Us & Them Tour kicked off in spring 2017 and spanned 20 months. 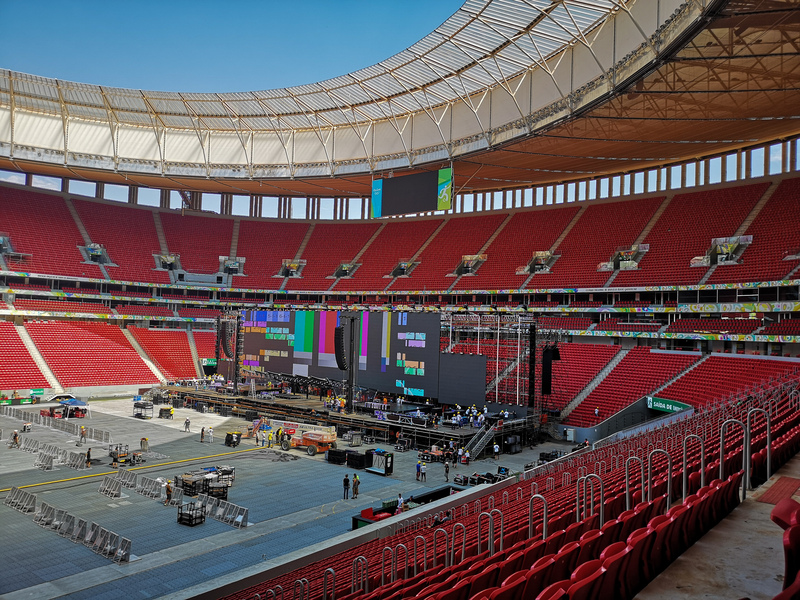 It visited the USA, Australasia, South America and Europe with 161 shows of varied design and inhabited arenas, stadiums, open air fields, parking lots and one chariot race course. Lucky Frog working with Creative Director Sean Evans and Production Designer Jeremy Lloyd provided screen design consultancy and the technical video direction of the shows. Roger loves a big, impactful design, so that’s what we set about doing. How do you jazz up such a mammoth video screen? Well, by turning the set into Battersea Power Station, of course! 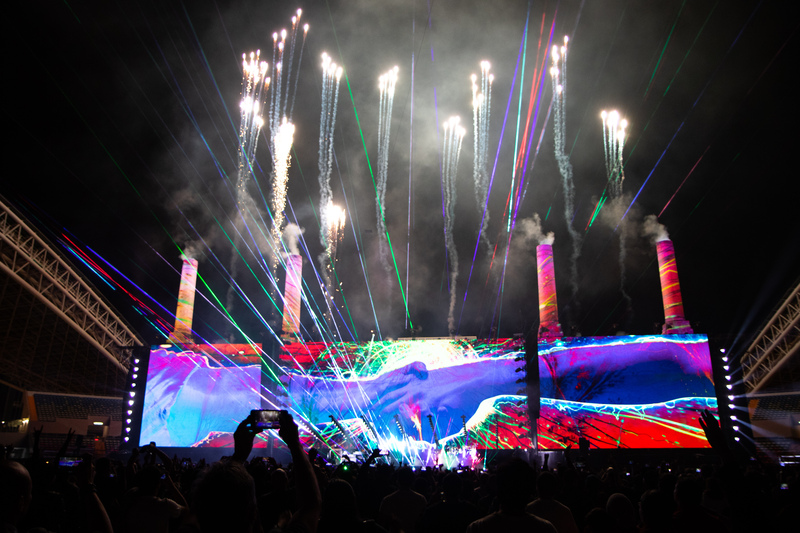 Both indoor and outdoor shows were designed to replicate Battersea Power station, and featured an incredible LED screen backdrop. The outdoor shows hid four Evention/Airwork designed and built inflatable cylindrical chimneys that ‘grew’ out of the set with real time mapping. 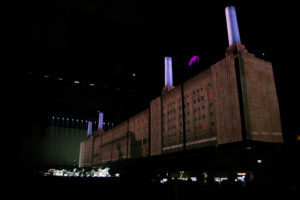 The indoor set-up featured projection onto 8 Tait designed and built fabric roller screens stage left; 8 screens stage right and 4 inflatable smaller scale chimneys in the centre. 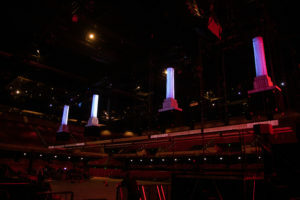 All were deployed along the middle of the arena directly above the audience as part of a spectacular reveal to open the second half of the show. To ensure the best quality video wall picture possible, Universal Pixels aka ‘UP’ supplied infiLED’s ER5 paired with Brompton Technology SX40 Tessera processing. The outdoor shows mammoth 21.8 million pixel LED wall configured as 10,836 x 2,016 pixels or 775sqm (64.5m x 12m) was built in situ in 7.5m wide sections using WI designed and engineered rigging and support, each section guided into place via 2 vertical beams attached to the locally-supplied upstage scaffolding structure. Each screen section had several carrier ‘wagons’ rolling along the vertical tracks, allowing the screen to be built from the ground up. This method ensured that each 7.5m section – and ultimately the whole screen – was held firmly in place and wind-braced from the start of the build to the completion of de-rig. This was necessary to minimise the risk of the screen sections turning into giant sails in the event of high wind! For Pixel wrangling and motion tracking, VYV’s Photon & Albion media servers were chosen. In total, across LED, Projection and tracking; 11 Photon servers were used and 49 Optitrack IR cameras. 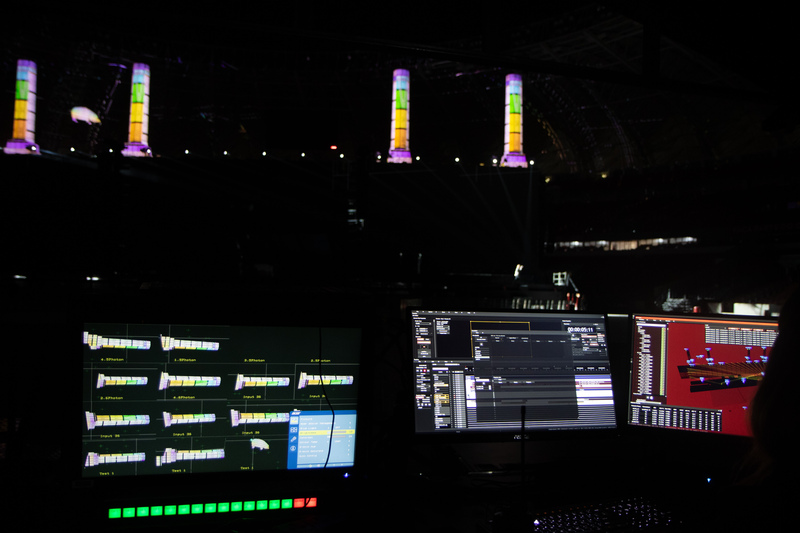 Enough VYV technology was transported to deal with both the arena and outdoor shows, re-configuring the system as the schedule demanded. The indoor shows used 4 active servers and a back-up to feed the 21 projectors covering 17 roller screens and 4 indoor chimneys. They also provided both performer and inflatable pig(!) tracking data to the lighting department (headed up and designed by Pryderi Baskerville) to enable automated follow-spots. 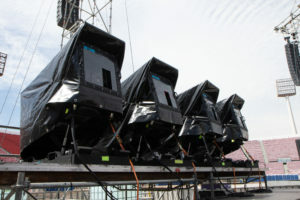 The only way the projection line-up was possible within the time constraint of the build was because of the advancement of Photons SLAC (StructuredLightAutomatedCalibration). This projection calibration method has a dedicated Optitrack IR camera per projector (or stack of projectors). 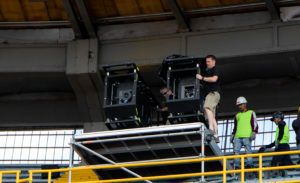 As part of the load-in process, strings of VYV Copernic balls consisting of an infrared emitter with retro-reflective coating are hung from the mother grid. The projector specific IR camera recognises the stepping stripes of structured light generated by the Photon calibration process as point reflections. The 2d representation of the 3d coppernic constellation from each camera or projectors POV (PontOfView) is how Photons math works out where and what shape each camera or projector pyramid needs to be. The roller screens housed copernics in the bottom corners which specifically positioned tracking cameras would read, to recreate the screens position in 3D space with the projected image ‘sticking’ to the screen surface as it moved. The outdoor shows saw 14 projectors cover 4 ‘chimneys’ with 3 blended projectors for each chimney giving 180 degree coverage. The two remaining projectors were overlaid to map onto ‘Algie’ the inflatable pig. In order to cope with the elements and the lack of rigging points, VYV copernic balls were integrated into a carbon fiber frame “the constellation”. Custom waterproof projector housing designed by Peter McKenzie of Qnetik enabled the projectors to be positioned and locked into place pointing at the constellation. SLAC can then establish the projector cone, as long as the Optitrack Camera and the projector lens relationship remains unchanged, and – a unique Photon feature – Real Time Calibration can be used allowing for the projector to be re-positioned onto the chimneys and understand it’s position in real time. The copernics buried in the base and peak of the chimneys allow for Photon to establish their position and with a combination of tracking and automation data the rise of the chimneys at the beginning of the second half is UV mapped in real time. Hitachi SK HD 1200 cameras were input through the powerful SAM Vega 400 series router and mixed using a combination of the SAM Kula desk and direct router switch cues from Photon. Much of the cuts and shots were choreographed to compliment the content so IMAG became part of the graphic artwork. How does the Richard sum up the most challenging role of his career to date?